When I made the jerk chicken a while ago I ended up with a lot of extra jerk marinade. I have been enjoying having the extra marinade around because it has made for some quick and tasty meals. I was looking for a light meal and I thought; What better than a salad with some jerked chicken? Juicy ripe mangoes were the next thing to come to mind for the salad. Lately I have been enjoying avocados and I thought that they would add a nice bit of relief to the heat of the jerk chicken. I have also been experimenting using beans in salads lately and this time I went with some kidney beans, though black beans also crossed my mind. The salad ended up being quite good. The avocados and sweet mangoes complemented the heat of the spicy chicken nicely. Marinate the chicken in the jerk marinade for 20 minutes to overnight. Add the chicken and saute until golden brown on both sides, about 3-5 minutes per side. Mix the lemon juice, lemon zest, oil, honey, dijon mustard, salt and pepper. Assemble salad and pour on dressing. Top with sliced jerked chicken. Your salad looks great! I love the pairing of sweet + spicy with the added richness of the avocado. mango + avocado + spicy jerk marinade = fabulous. I always grill pineapple with my jerk but man that mango sounds good and awesome. That looks like the perfect summer meal! Yum! Nice dish. Funny was going to make jerk chicken last night, but was short a few ingredients. Always love chicken with mango. Kevin , what a lovely blog with so many tasty recipes. This salad looks realy yummi.Is hard to resist that great photo! The salad looks awesome with the avocado. Very islandy. The chicken looks great, but I’m loving the combo of mango and avocado! Yum! The chicken sitting a top the fruity salad looks so delectable! Looks light and so tasty. The colors in the photo are beautiful too. that looks delicious. i love jerk spice with mango. Wow Kevin,What a gorgeous looking salad! Wish I had it for lunch today! This looks beautiful. Spicy and Sweet a perfect combo. Oh yeah, another fab meal. Now, let me go look for that jerk marinade. Yummy! i love the colors and the combination of the dish! I love a good jerk and I love jerk chicken too! aaah this looks delicious! a perfect summer salad. The combination of mango and the jerk chicken would be wonderful….full of flavor. Another lovely dish, Kevin! I love this! We love jerk chicken, and pairing it with mango and avocado is pure genius, Kevin! What a great combination. I am going to try this recipe this weekend. The concept it simple: 1 plate, 1 recipe, 1 chef, 10 questions. There are some really beautifully delicious recipes from incredible chefs that you might want to try! Kevin, I don’t know what you do to make your living but food styling is something you might want to consider – even if you do it free lance. You do have a flair. That jerked chicken looks really appealing. Mango and Avocado are two of my favourite flavour combinations. The chicken looks amazing. Love all the components for this salad! I like that it seems like a real meal and would fill you up nicely! This looks fantastic… love the flavor and texture combinations. You are the hardest working man in the food blogging business. Keep up the good work. Wow…this salad looks fabulous. I’ll eat almost anything with mango or avocado in it. Kevin, this looks really appetizing!! 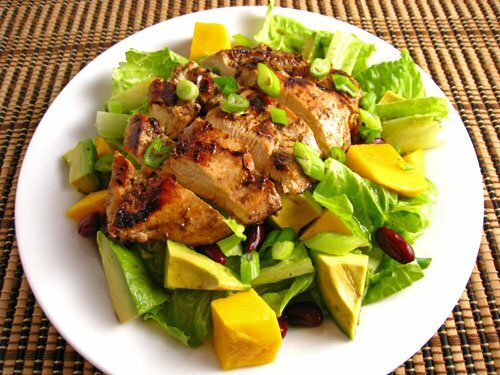 salad, mango, chicken – all good! This looks absolutely amazing. I have two mangos at home and was thinking of making a salsa – I plan to search your archives first. Of course, you were the first person I thought of when I thought of making something with mangos! It’s been awhile since I”ve been able to get my hands on a mango that creates big, yummy chunks like that. I love the flavor combo of this dish. I always need something a little sweet to cut down the spicyness! I have to agree with what others are saying, the combo you have created here sounds like it goes really well together. What a great dinner to serve on a hot summer night. I just might steal this as I love jerk chicken. Oh, Kevin this looks delicious even in the middle of winter. Scrumptious. Avocado and mango are always a good combination so added to jerk chicken..even better. Great idea! Yum. It's good with 1/4 cup chopped cilantro!